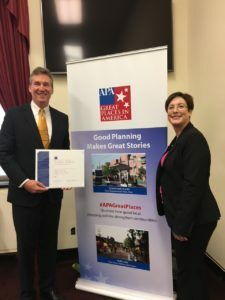 Mansour Gavin President Tony Coyne accepted an award for Cleveland’s Public Square from the American Planning Association on September 25, 2018. The APA added Public Square to its flagship program, Great Places in America. Coyne serves as Chairman of The Group Plan Commission, the group responsible for Public Square’s revitalization. For more information on the award click here. To view Public Square selected as A Great Place in America news release click here.